Yesterday, I got an idea in my head. I decided I wanted to travel, or drive my way from Canada all the way through America down to South America. So this evening I started my research. My first step when planning is always to google the places or general route that I am looking to take and this evenings results brought up something I now at least want to see. and realise this is probably a place that you should avoid like the plague, especially when you hear the jungle is mostly used for drug runs. However, I really want to see this forest now, even if it is only from the sky. Well, as it turns out, there is absolutely NO ROAD connecting them, and all travel advisories clearly say "Don't Go", even if you feel somewhat suicidal. 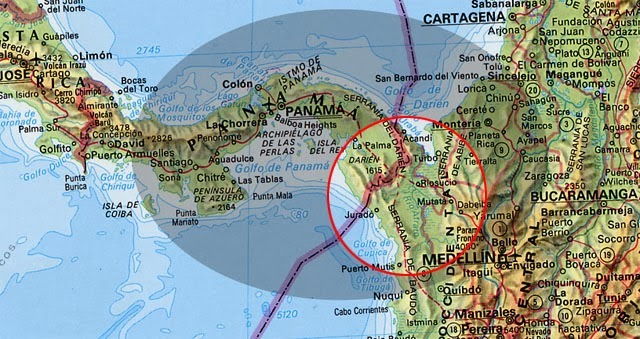 I am talking about the wild and wildly dangerous Darien Gap.